How does it feel to be the owner of an e-commerce store? While the world thinks of it as a very cool job, only you are aware of the great responsibilities. Managing the end-to-end e-commerce process is a hectic yet challenging task. As an entrepreneur, what do you think is the most difficult part of e-commerce? According to most of the entrepreneurs, Logistics is the common answer. Technology has made remarkable changes in every aspect of life. Similarly, logistics, the pain-point of eCommerce, can also become hassle-free by applying the right mix of technology and strategy. Some of the logistics platform providers have made this achievable by tieing up with the best delivery partners. ShipKaro is one of India’s leading logistics providers designed to make it easy for e-commerce firms to deliver their products to customers. Every e-commerce shipping solution has something special about it. So what is it that makes ShipKaro special? You would have struggled a lot to find the best ways to reduce the pain of logistics but approaching multiple delivery partners for a tie-up becomes a tough job. You need to be involved in paying upfront costs to every shipping partner, read the lengthy documentation and sign multiple contracts. 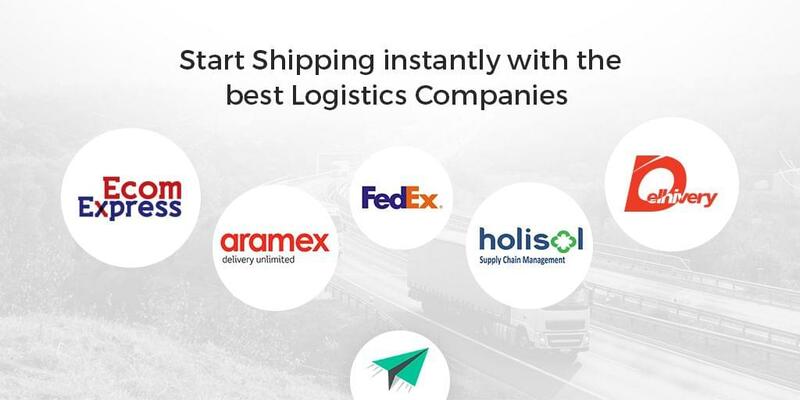 Instead, you can choose a platform that provides integration with multiple shipping partners and saves your time involved in the tie-up process. In simpler words, you can choose ShipKaro as your reliable shipping partner. The set of comprehensive benefits that makes ShipKaro special includes discounted shipping, partial fulfilment, bulk order uploads, price comparison and many more. In this article, we bring for you the multiple options provided by ShipKaro for making your shipments easier. Delhivery helps in overcoming the pain of logistics by providing the best services to the customers. Delhivery serves over 9000+ pin codes across 800+ cities. It provides reverse logistics, product uploads, and many more options. With Delhivery, you can enjoy benefits like hassle-free shipping, easy cash on delivery options and smoother deliveries at the domestic level. Aramex is a global e-commerce delivery solutions provider which is well known for satisfying customer needs with their salient features like coverage to global pin codes, easy integration, value-added services like labelling, packaging and many more. Express courier delivery, freight forwarding, logistics, supply chain management, e-commerce and record management services are the asset of Aramex. Benefits provided by Aramex includes coverage to global pin codes without any issues. A well known American multinational courier delivery services company-FedEx has been providing convenient services to customers for decades. It is one of the e-commerce courier companies that delivers to more than 19000 pin codes providing services to more than 220 countries and territories. FedEx provides hassle-free delivery even for heavyweight shipments, you need not worry about proof of delivery and the documents. ShipKaro and FedEx together have provided commendable services to multiple customers throughout the country. Ecom Express Private Limited is a leading e-commerce delivery solution provider with end-to-end e-commerce solutions. They work with a focus on speed, safe and reliable nationwide express delivery services to e-commerce industry. Ecom Express covers around 17000 pin codes and has more than 1700 delivery branches. Configuring Ecom Express with ShipKaro is extremely easy, once the API integration is done, access is given in the admin panel/dashboard. ShipKaro integrated with Ecom Express offers the best logistics and shipment processes to its customers. Holisol Logistics is a supply chain and logistics solutions company. This e-commerce courier company is a trustworthy choice with respect to efficient services and damage-free delivery. The add-on features provided by Holisol includes consulting and design, retail, transport packaging solutions for heavy machines and end-to-end logistics management. Holisol helps the customers in achieving their logistics targets by closely studying their e-commerce business and supply chain objectives. All the features provided by various delivery partners makes ShipKaro the number one e-commerce shipping solution for its users. If you are still searching for a dependable, efficient and affordable option for managing the logistics part of your e-commerce business then ShipKaro has got you covered. You can sign up for free and start exploring the platform right now.